Take your space to the next level when you visit our showroom for hardwood flooring from our stunning collections. At our store, we make shopping for hardwood, including engineered hardwood flooring, enjoyable and easy. Shop our wide selection of options to discover more on our different styles, colors, finishes, and grains. As a nationally recognized carpeting and flooring store, we offer an extensive collection of products, including traditional and stylish wood floors. We carry top-notch manufacturers that feature a variety of color, species, and style options. At our local showroom, we are committed to providing the best quality options for your home. Looking to upgrade your basement or bathroom? Due to the high levels of humidity in these spaces, we recommend installing engineered hardwood. This material is our preferred alternative, as it stands up to damage caused by water and moisture. Made from several layers and containing a resilient wear surface, this material is the right option for rooms like entryways and bathrooms. Engineered hardwood flooring may be for you if you enjoy a more luxurious look, but at an affordable price. These floors will leave more money in your wallet at the end of that day and support the green movement by delivering an eco-friendly option for your home. 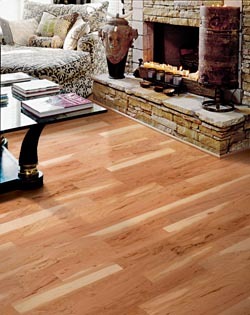 If you are tired of the same old look throughout your home, make a change and install a new set of hardwood flooring. When you are looking for the top option on the market for your home, solid hardwood is a smart investment to make. Solid hardwood flooring gives a timeless look to any home. Whether your style is rustic, contemporary, modern, craftsman, traditional, Victorian, bungalow, or another option, solid hardwood floors are the way to go. This beautiful material delivers a stunning look and feel, with a variety of finishing options available. It can also be sanded or recoated to complement your next home improvement project. It is also easy to clean and maintain, making it a classic addition to kitchens, living rooms, and bedrooms. Add value to your home and enhance the atmosphere in every room with our new hardwood floors. They have a reputation for creating distinguished and refined appearances. Rooms with these floors exude natural beauty and opulence. Depending on your interior-design theme and accent pieces, these floors will complement the theme of any room. Whether you are remodeling a formal guest bedroom or designing a friendly living room, our products are designed to add character to every space. Once you've made the right choice for your new floors, it is important to ensure that your installation is handled correctly. Due to the complexity of a hardwood flooring installation, it is a job best left to the professionals. Our experienced team members are happy to handle projects of any size. Contact our hardwood floor team today to learn more about our selection of hardwood flooring. We proudly install solid and engineered hardwood flooring in spaces throughout Greenville, Spartanburg, Easley, Anderson, and Greer, South Carolina.